Hearts defender John Souttar endured a miserable night in his third appearance for Scotland, receiving a red card as the national team went down 2-1 to Israel. The 22-year-old was given his marching orders in Haifa on 61 minutes for a second yellow card after tangling with Israeli forward Munas Dabbur. 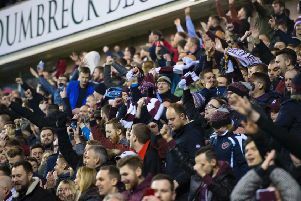 It was a traumatic evening all round for the Scots, who struggled to contain their slicker hosts despite taking the lead on 25 minutes when Charlie Mulgrew converted a penalty won by Hearts forward Steven Naismith. However, an equaliser from Dor Peretz and a Kieran Tierney own goal gave Israel the Nations League Group C1 win.